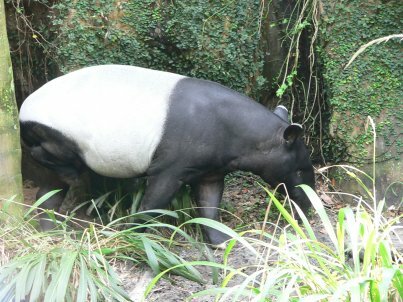 The Malayan Tapir, Tapirus indicus is the largest of the Tapirs, and it lives in South East Asia. shelter in forests and thickets during the daytime, but come out at night to forage on grasslands or near water. in nights when the moon is out. .
to the dramatic black and white pattern seen in the adults. Females have offspring every other year. Sexual maturity is reached at about three years of age, and the lifespan is thought to be about 30 years. Habitat destruction and overhunting are the two main factors contributing to their endangered status. Habitat destruction has mainly been a result of agriculture and and increase in cattle grazing. Natural enemies include humans and tigers. Fahey, B. 1999. "Tapirus indicus" (On-line), Animal Diversity Web. Accessed October 04, 2010 at http://animaldiversity.ummz.umich.edu/site/accounts/information/Tapirus_indicus.html.